I scream, you scream, we all scream for… baijiu ice cream? 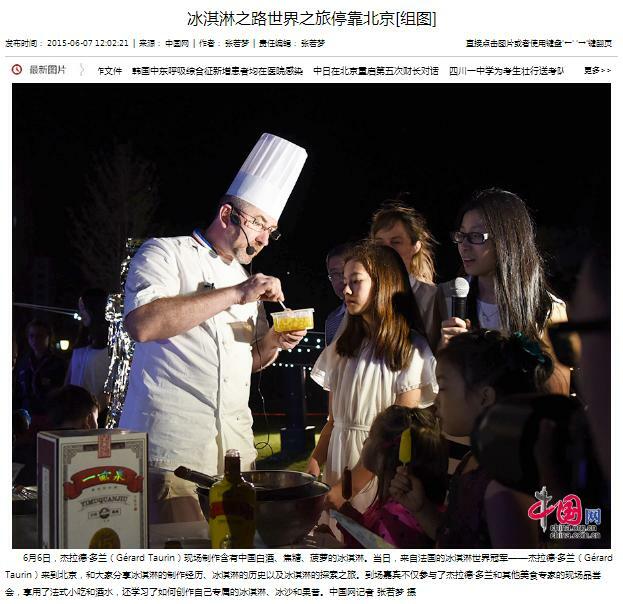 For one evening, a product typically served warm and in liquid form was used to create a chilled and solid treat as French ice cream maker Gerard Taurin worked his magic in Beijing. Taurin demonstrated an ancient technique that uses saltpeter as a chilling agent and made an ice cream that included baijiu from Yimuquan (一亩泉), a major producer in nearby Baoding and one of the event sponsors. He topped the concoction with pineapple to complement the baijiu flavors. It seemed to be a hit with tasters given the mix of flavors and the taming effect of the cold temperatures on the spirit’s pungency. The event was held at the l’Atelier kitchen in Shunyi and included ice sculpting, canapes, smoothies, and more. It was organized by the French Junior Chamber International of Beijing (JCEFP) and was part of Festival Croisements. Also see this post for experiments with deep-fried baijiu and expect more food experiments to come.